Mar 15, 2017: Are these some good starter items? Apr 19, 2017: New to electronics, bought a pack of what I thought were LEDs and resistors, am now thoroughly confused. Mar 08, 2018: Which breadboard kit to buy? 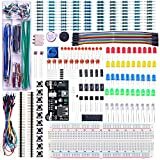 Nov 09, 2018: purchased a few breadboard kits, now have a bunch of resistors and leds but want to make/explore more sound based stuff... ideas for types of basic components?